Teeth whitening is something I have never tried before but was something I was always interested in doing so to see if it would actually make a difference. What put me off trying products to get the results were peoples reviews as I had read ones where people said it left their gums feeling sore and I'm dreadful when it comes to pain especially if it's something to do with my teeth, however when theses Instant Whites Swabs* came through my letter box I was excited to give them a try. Instant Whites is a 7 day system that claim to give you results up to 9 shades whiter in just 7 days. My teeth aren't as white as they used to be nor are they very stained, they're just very in-between I would say. So I started using these with high hopes, I mean up to 9 shades whiter, yes please! The swabs are filled with liquid and when you're ready to use them you just collapse both ends into each other until the swab starts secreting the liquid. When you use these it is recommended that you don't eat or drink anything for at least 30 minutes after. I will admit this scared me a little and I wouldn't eat or drink anything until an hour later just incase! When you apply this to your teeth you can feel almost like a cooling sensation which is strange but I must say after using this I could notice it working and my teeth would look a little whiter than they did before starting. I love how simple these were to use, simply just apply the product to each tooth and rub in circles for about 5 seconds on each tooth. Results wise after 7 days I did notice a difference and surprisingly so did other people as I was asked what I had been using. You can find Instant Whites at your local Boots store or find them online at Boots here. The 7 day system will set you back €42.99 now before I used these I would have said that was way too expensive, however after getting the results I got which is definitely a few shades whiter I would say that they are worth the price tag as you get the results! I'd definitely recommend the Instant Whites as they were so easy to use, only took 5 minutes out of your day and were pain free! 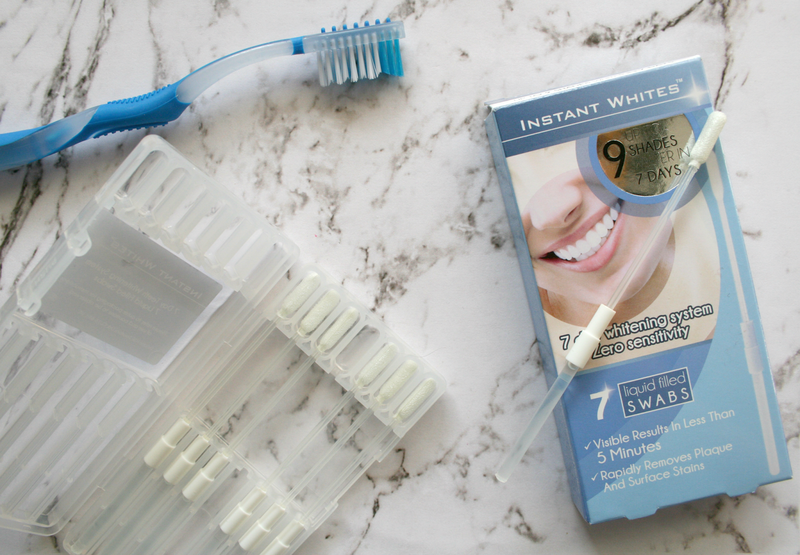 Have you ever tried at home teeth whitening before? Sounds amazing and if it works it's so worth the money! I might have to try it out, thanks for sharing hun!